Gujarat University B.Ed Admission Application form 2019: If you want to be a teacher then you need to take admission in B. Ed courses. B. Ed is a compulsory course for teaching profession aspirants. Many universities are offering B. Ed courses to students. Gujarat University is one of them and soon Gujarat University is going to release the GU B. Ed application form for 2019 session. B. Ed is a two-year course and to take admission in B. Ed, first the interested candidates need clear the entrance test conducted by the university. Gujarat University will soon release the application form for the interested students so that they can appear in Gujarat University B.Ed Entrance Test 2019-2020. In this article, we have compiled all the essential information related to B.Ed Entrance Exam 2019-20. Students who are seeking admission in B. Ed course can fill an online application. We have mentioned the link to apply online for the entrance exam of B.Ed below at the page. Here are the details of important dates, associated with Gujarat University B.Ed exam. The university will release the notification for Gujarat B. Ed course in April 2019. The admission process will also start with the release of notification. The last date to apply for the B. Ed entrance examination will fall in May 2019. The Entrance exam will be conducted in the month of May 2019 and its result will be declared in June 2019. The admission process for the regular course of B. Ed will start in July 2019. We will update you as soon as the university will announce the dates for all the above mentioned events. To apply for the B. Ed entrance exam, interested students will have to fill an online application form. The online application form will be available on the official website of Gujarat University. As of now, the university hasn’t uploaded the application form but soon the same will be uploaded. Step 1: Go to the official website of the University to fetch the application form. The link of the university has mentioned at the end of this article. Step 2: Fill all the asked details including your educational and personal details in the for. Step 3: Upload your signature and photograph. Step 4: Make the payment of application fee and submit the application form. This is how you can fill the application form for Gujarat University B. Ed Entrance Exam. Candidates can pay the fee online or through debit/credit card. The application fee for Gujarat University B. Ed Entrance test will be declared by the university with the release of notification of admission. Photo ID card (e.g. Adhar Card, PAN Card Voter ID Card etc.). To fill the online application of Gujarat University for B.Ed the applicant must have a graduation degree preferably in Gujarati or Gujarati should be one of the subjects in your course. To seek admission to the course the candidate should have a minimum of 50% in graduation (45% for SC/ST/OBC/PWD) from the recognized University. 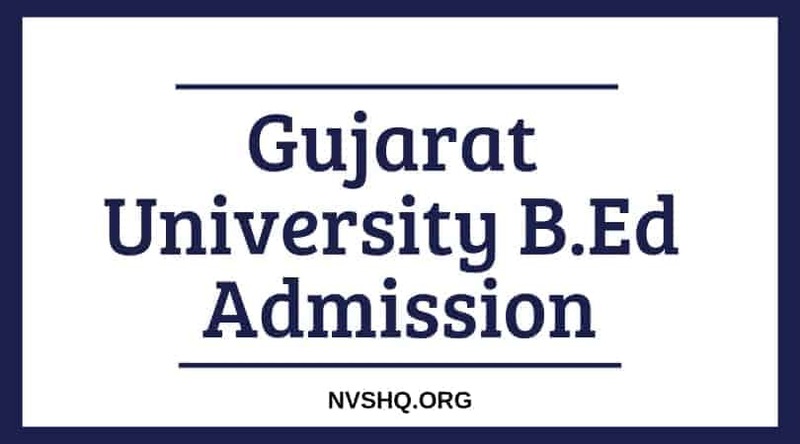 To download the admit card for B.Ed entrance test in Gujarat University, the applicants will have to enter their application number as well as a date of birth to log in and to download the admit card. After login, the page will be direct to your admit card. Take a print out of it and keep it safe with you. Remember, you will not be allowed to sit in the exam room without your hall ticket or admit card. The date for the declaration of result of B.Ed entrance exam is not yet released by the Gujarat University but if we look at the previous years’ programme then it is expected that the result will be declared in June 2019 and in July 2019 the admission process for the admission in B. Ed course will start. The admission in B. Course will be based on the merit list of the entrance exam. Counselling Process will start soon after the declaration of result. Candidates can get the date of counseling from the official website of the university. Carry all the below mentioned documents at the time of counseling. If you are serious to get admission in B. Ed course then you will need all the below mentioned documents to get the admission in Gujarat University. A photo ID card (e.g. Adhar Card, PAN Card Voter ID Card, etc.). Gujarat University, situated in Ahmadabad is affiliated by the University Grant Commission (UGC). The Main Motto of the University is “Diligence leads to Excellence”. This university was established on 23 November 1949 and it is famous for the education offered here. Gujarat University offers many UG and OG courses including B.Ed. Gujarat University conducts an entrance test to offer admission to the interested students. Candidates, who will clear the B. Ed entrance test, will get the admission in 2 years regular course of B.Ed. The candidates, who wish to apply for B.Ed course in Gujarat University, will have to apply online for the entrance exam and result of entrance exam will decide their admission. THERE IS NO LINK IS GIVEN FOR ADMISSION.